When your friends invite you on a crazy mission to visit a remote restricted-access cave under a glacier in a National Park, you don’t decline the opportunity. Or at least, I don’t. 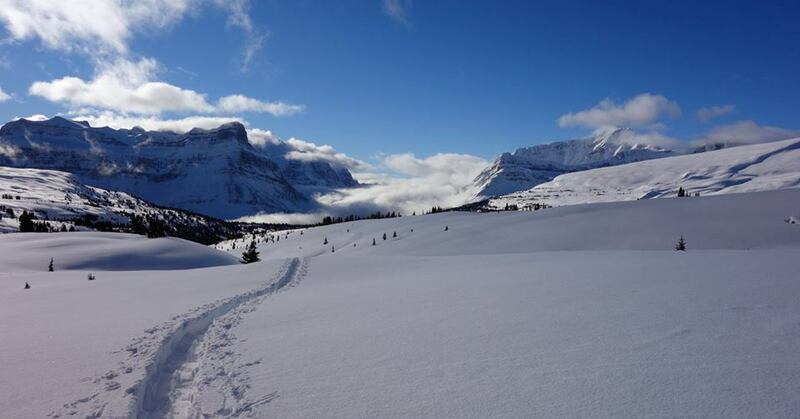 Such was the case when my friends Gavin and Katie invited me to accompany them on a weekend winter expedition to Castleguard Cave in Banff National Park. 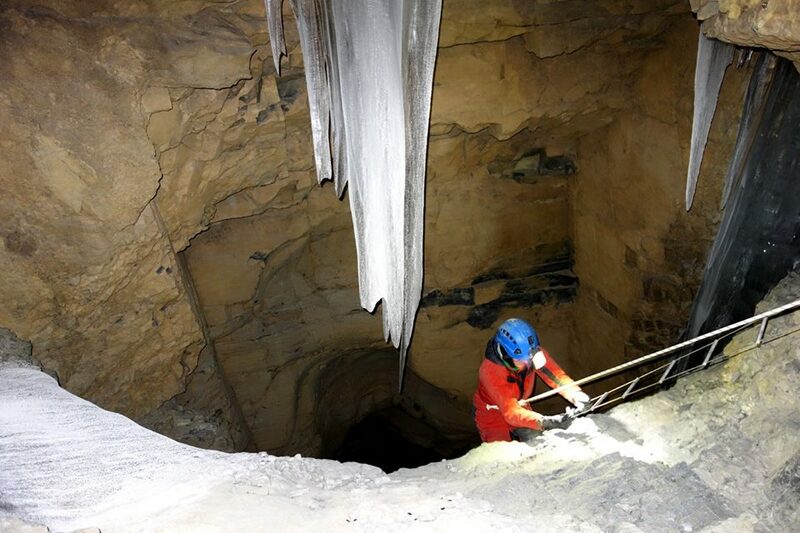 The cave is gated and locked for safety purposes, but my friends had obtained the key because our mission was to record empirical data for the Alberta Speleological Society. 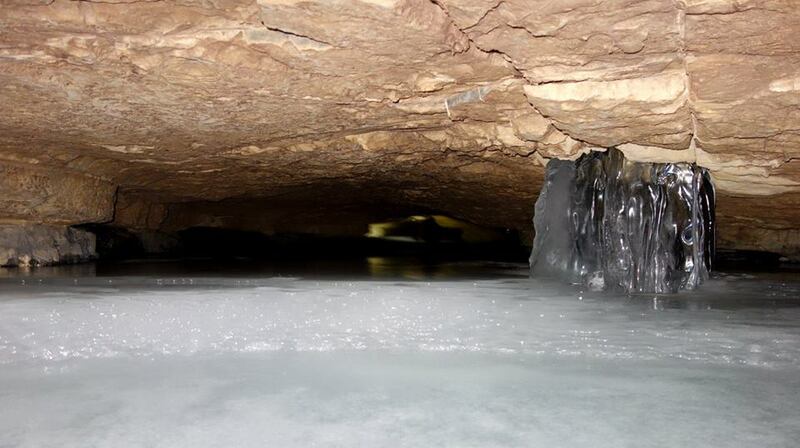 The trip must be made in the wintertime, due to the fact that water flows out of the cave during warmer months. So on a chilly Friday evening in January we left the city and spent a night at HI’s Rampart Creek Wilderness Hostel. Saturday morning we woke up before dawn, drove to the parking spot, geared up, and began our journey toward the cave just before sunrise. 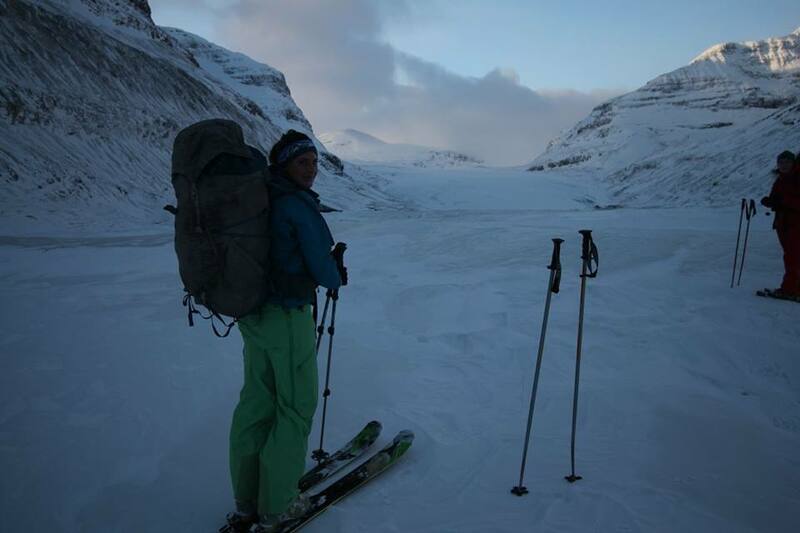 With packs full of camping, glacier travel and caving gear, we moved along rather slowly. 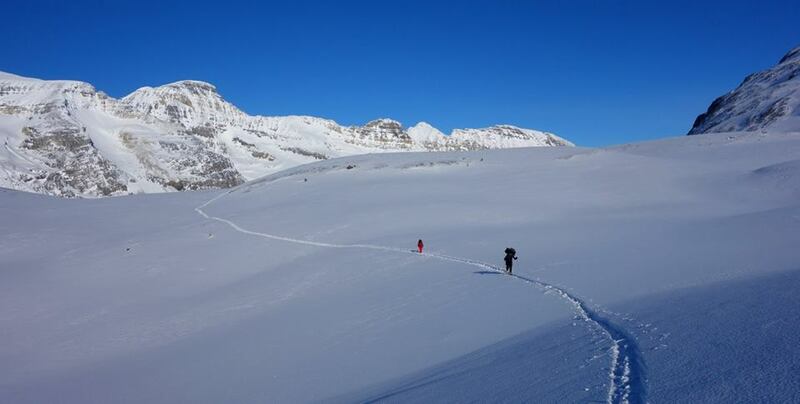 While I took to alpine touring skis, my poor compadres were using snowshoes. After ascending through some initial trees we crossed a large barren glacier moraine before reaching Saskatchewan glacier. 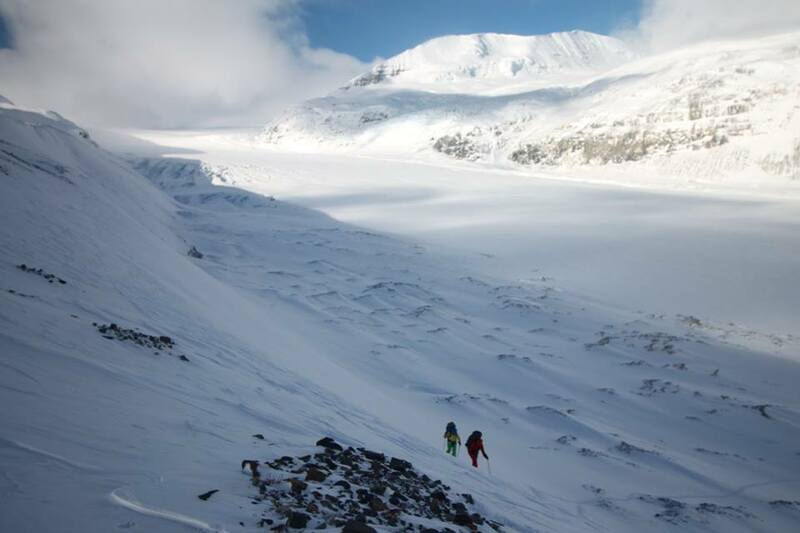 After crossing the wind scoured glacier for a couple of kilometers, we arrived at a steep, snowy moraine wall, which took some time to climb due to snow depth. Once atop the moraine wall we had arrived at Castleguard Meadows. 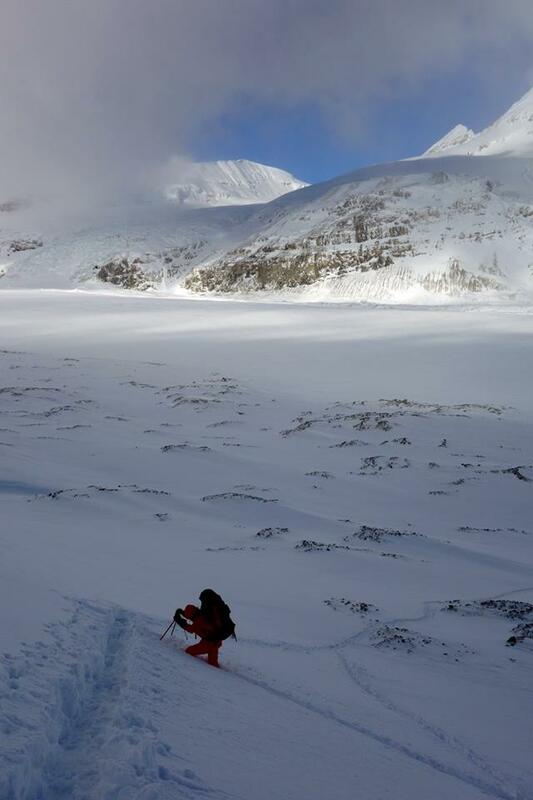 Here we had to traverse rolling hills through deep snow. Because snowshoe tracks are rather difficult for skiers to follow (large holes instead of a flat track) it made the most sense for me to go first. Therefore, I exhaustively broke trail for hours and hours, paving a little path through the snow for my friends, who still sank deeper into the snow behind me, despite the fact that I’d compacted a little of it for them with my own weight. At the conclusion of the meadows we crossed a small lake then pulled out the GPS to navigate our way to the exact cave location. We finally arrived at the mouth of the cave at dusk, after nearly 12 hours of travel toting heavy bags through deep snow. We set up “camp” just inside the cave, where we were protected from the wind, though the air temperature was still very cold. 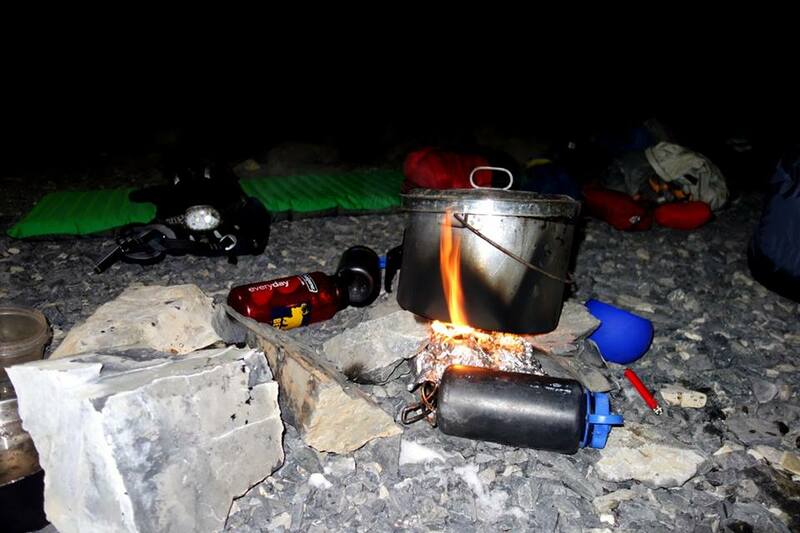 The camp stove wasn’t working so we had to jerry rig a way to burn fuel using tinfoil and a pot. Too exhausted to do much else than sleep, we tucked into our sleeping bags and shivered our way through a cold night. 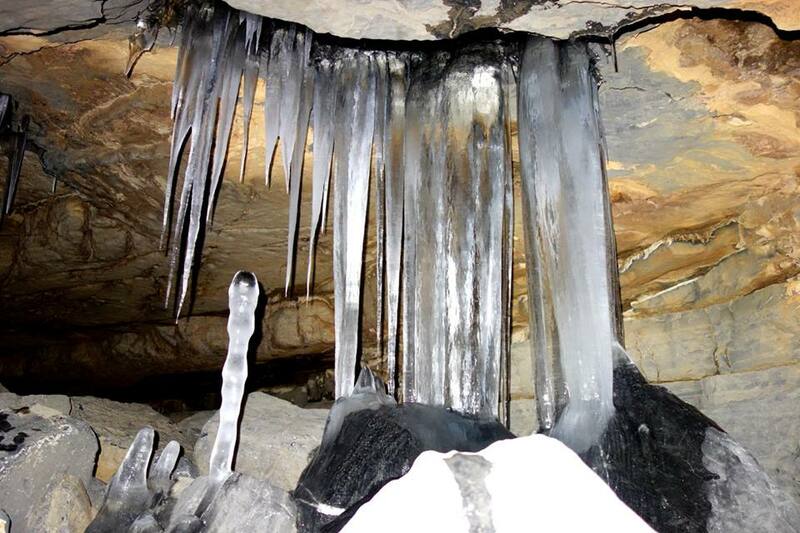 In the morning we pulled our sore bodies up and finally ventured deeper into the cave. Katie sets up and descends a ladder within the cave. 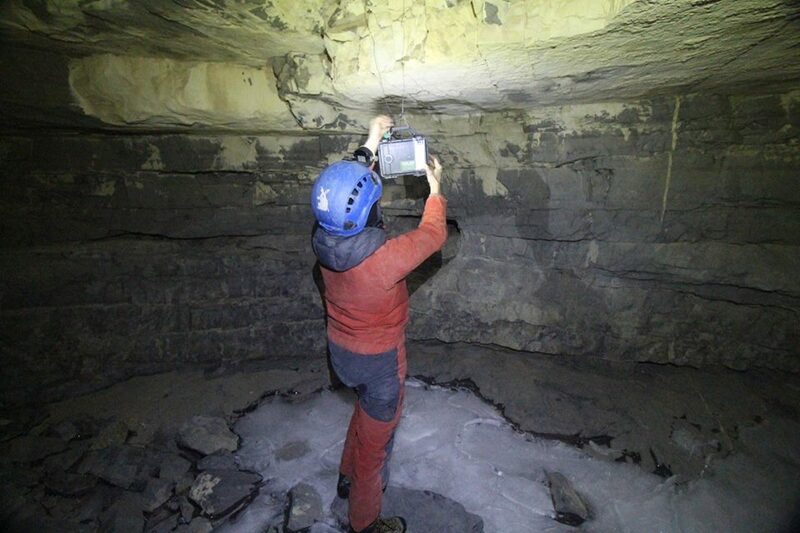 Katie hangs a bat detector in the cave. 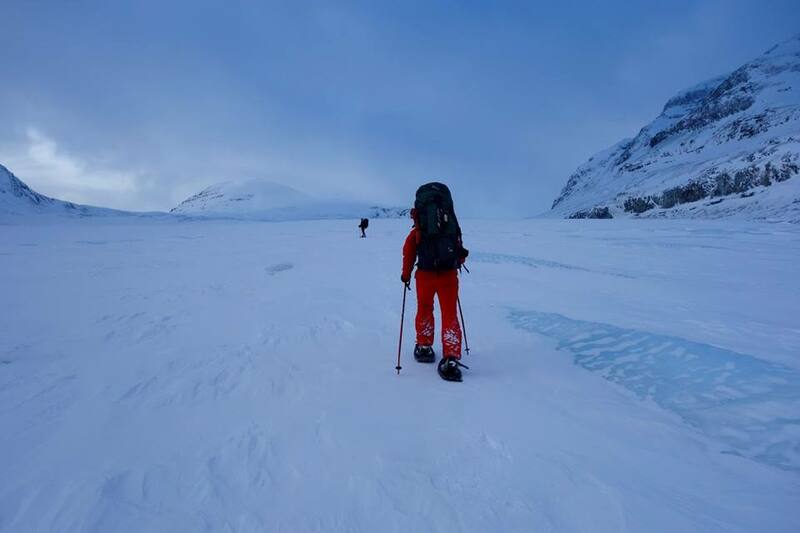 Once we’d explored the cave and recorded the necessary details, we re-packed our belongings and made our way back out through the meadows and down the glacier on the same day. In total we logged 42kms over two days, plus spent a couple of hours underground, and camped in a chilly cave for a night. A true sufferfest, I can only classify this trip as “type 2 fun.” Would I do it again? I’ll give it a strong “maybe,” haha! The trip might be easier at another time of year when there is less snow accumulation, or if done with more skiers. The toughest part for me was breaking trail endlessly. 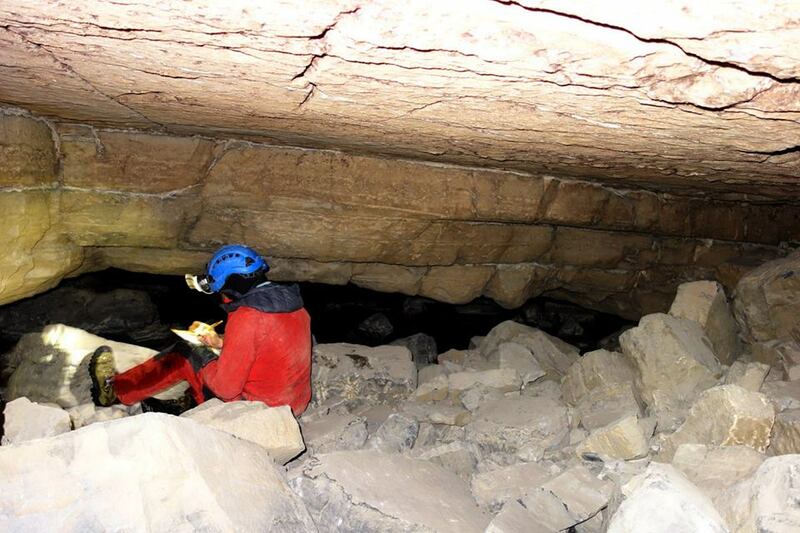 If you’re interested in caves in Alberta, I encourage you to check out the Alberta Speleological Society. WOW! What an adventure. I could never do that with my claustrophobia! I don’t really get claustrophobic usually, but I definitely felt it in there! Some places I had to wriggle through on my tummy as it was too tight to even crawl on all 4’s.